The spider was first recorded in Britain in 1922 at Rye, East Sussex (Locket & Millidge 1951) and for many years seemed to be restricted to a few areas close to the south coast in Sussex, Kent, Hampshire and Dorset. Since the 1970s the spider has increased its range, spreading inland from a number of its coastal locations. The spider is well established in Dorset (Merrett 1979) and records from as far back as 1965 in East Cornwall have come to light (Smithers 1992). A record from Derbyshire (Dobson 1996) was assumed to be an accidental import, but in 1997 the spider turned up both in the very south and north of Essex (Ruffell 1997). There were then records from Surrey (Baldock 1998), Wiltshire (M. Askins, pers. comm.) and the spider is widespread in the East Thames Corridor (Harvey 2000). Remarkably, P. Harvey has been given details of a sighting near Bexley, north Kent in 1965 confirmed by a photograph. There is a strong implication that the populations in the West Country and north Kent originate from nuclei dating at least this far back. Harvey (1999; 2000) and Smithers (2000) have provided distribution maps showing the spread of the spider. It is widespread in western Europe (Merrett 1990). The spider has a very striking appearance with black and yellow horizontal bands on its abdomen. It spins a large orb web with a stabilimentum and favours areas of coastal chalk grassland, open rough grassland, wasteland and roadside verges. P. Harvey (pers. comm.) has seen depauperate juvenile spiders in a wheat field, but these individuals were unlikely to survive to mate or produce egg-sacs. 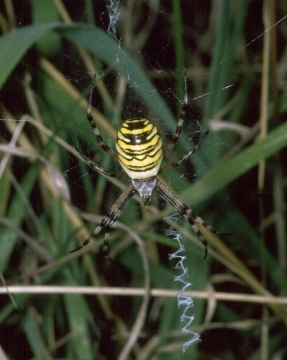 In northern France the author has recorded Argiope bruennichi in large numbers in unmanaged damp grassland. The large orb webs are slung low down in the vegetation and the adult spider is easily hidden by the surrounding herbage. Grasshoppers form the main food item. The large urn shaped egg cocoon is positioned in the higher levels of vegetation and the eggs over-winter, hatching out in the following spring. Both sexes mature in the late summer, the females perhaps living on until October but the much smaller males living for only a short time. There has been a substantial increase in sightings of the spider during the period from 1990. At sites where A. bruennichi is present, individuals can number into the thousands (P. Smithers, pers. comm.). Any form of regular cutting of grassland will destroy the webs and the over-wintering egg cocoons, presumably explaining why large populations seem to be confined to unmanaged rough grassland and waste ground. Commercial and housing development of wasteland can threaten populations, but the successful spread of the species during the 1990s shows that at present these threats are not serious. Wasp spider unleashes its' death-ray.